Charles Csuri began making computer art in 1963. The artist saw potential in this new medium for creating objects that could be transformed and imbued with possibilities. Csuri's scientific colleagues embraced his vision. Most in the fine arts community, however, did not share Csuri's enthusiasm. 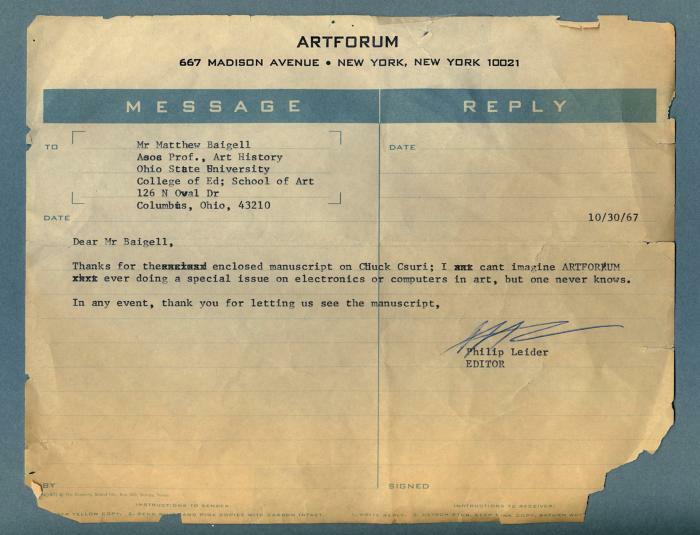 This letter from an Art Forum editor responds to art historian Matthew Baigell's inquiry about possible publication of Csuris computer art in Art Forum.